JAKARTA, Indonesia (CNN) -- Search crews have rescued nine more passengers who survived a ferry capsizing off the coast of Indonesia, though more than 230 people are still missing. 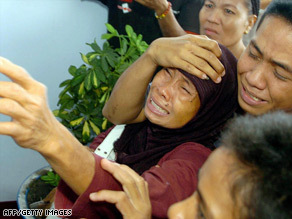 A woman grieves after learning her son is one of the victims in the Indonesian ferry accident. The nine survivors were rescued by a navy ship Monday afternoon, bringing the total number of survivors from Sunday's accident to 30, said Col. Jaka Santosa, chief of search and rescue operations for the Indonesian navy. One body was also recovered Monday. The search and rescue operations continued Tuesday, with five navy ships joining the effort. The ferry was carrying 267 people. Rescue efforts have been hampered by severe weather, including heavy rains and strong winds, according to local officials. The Teratai Prima ferry left Pare Pare on Sulawesi island in central Indonesia on Saturday evening for Samarinda, East Kalimantan. The ferry overturned about 4 a.m. Sunday off the coast of Majena in west Sulawesi after being pummeled with waves as high as 19 feet, survivors said. Indonesians rely heavily on ferries, since they are the easiest way to navigate throughout the country's 17,000 islands.